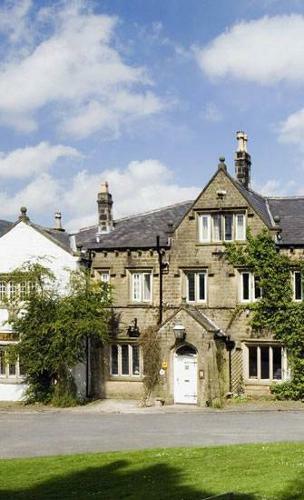 There are places that you just know you are going to relish - even before you get there - The Inn At Whitewell, (Forest of Bowland near Clitheroe, Lancashire BB7 3AT) - is just such a place. I’d been recommended it. I’d read about it. I’d ignored it. Arrival is pretty special with the reception desk contained in a parallel room fitted floor to ceiling with racks of wine, hand selected by the proprietors and all for sale, stacks of foodie books all for sale. It’s always slightly 21st century embarrassing checking in as two heterosexual men. Alan and I always make a point of saying too loudly, two single rooms! "We’re together but not like that" he says. Elsewhere the size of the room would rate as a "suite". Views are of miles of moorland and solitary oak trees. The river Ribble rushing through the grounds just feet from the room! Great bathroom. Great shower. Moulton Brown product: with shower gel manacled to the wall. All that said, it seems churlish to criticize the food at dinner. It rated a 7 out of 10, which is pretty good, but was so very close to being a lot better. There is a bar and a restaurant. Excellent bottle of Baye a Bordeaux. We are told the evening’s specials will be out on a now empty easel in the bar at about 7:15pm. Regulars, and there were many, obviously know this and a momentary sense of tension filled the room by 7:10 with all eyes on the empty easel. At 7:22 the blackboard was set in place. By 7:13 there was an unseemly scrum at the bar to place orders. Alan and I don’t like coming second - just see us in the queue for speedy boarding on Easy Jet! But at the time we had to settle for second. Crab salad came frigid from the fridge and rammikin shaped. Warm salad with strips of beef was overcooked and tough. Grouse was top notch ten out of ten, but spoilt by pretty woeful veg with an over-sharp red cabbage. Medium rare sirloin was again overcooked. For somewhere that has a long list of puddings, and in the middle of a September moor, there was nothing with custard. Crème Anglaise instead. Fussy, fussy, fussy – but I would go back with Freya and dog (to make use of the dog beds placed outside each room). Breakfast was a ten out of ten with marvelous bacon, fresh orange juice, good coffee and a view out over the swans on the river Ribble.